Real moms tell us what it's like to have a baby with this serious birth defect, which is increasing at an alarming rate. Nothing could be more stressful for a pregnant woman than finding out your baby has a serious birth defect. But that's exactly what's been happening more often with the growing number of cases of gastroschisis, as we recently reported. The birth defect, in which babies are born with a hole in their tummy where intestines and organs can spill out, can have many different outcomes—some kids go on to lead normal lives, while others are more seriously affected in the long-term. Three moms of children with gastroschisis tell Fit Pregnancy about having a baby with the condition, and what their child's life is like now. When Brianne Coffey (pictured) first learned her son Liam had gastroschisis, she had no idea of the roller coaster of doctors and surgeries that awaited her for the next two years due to complications from his complex case. During genetic testing at 12 weeks, she found out her baby had either gastroschisis or another abdominal wall defect, ompholocele, which is more serious. "My partner, Mark Brown, and I were very scared because we didn't know much about either," she tells Fit Pregnancy. "After an ultrasound at 16 weeks, it was confirmed that it was gastroschisis. This was a relief—we knew there would be challenges faced during pregnancy and after birth, but we were willing to face them." Her pregnancy was monitored closely as high-risk by OBs, but Liam had his own plans. "We had an induction date scheduled before his original due date, but at 33 weeks, he stopped showing signs of growth on the scans," Brianne says. For reasons not totally understood, gastroschisis babies are often born early, and Liam arrived at 34 weeks, five days. Even though babies with gastroschisis have their intestines on the outside, they are surprisingly still able to be delivered vaginally, as Liam was. "After he was born, I got to look at him, but the team rushed him off to the NICU so fast that I didn't get to hold him," Brianne says. "When I looked at Mark, I saw worry on his face. I told him to go with the team because I didn't want Liam to be alone. I had to be strong for my partner and our son no matter how worried I was on the inside." The first of Liam's four bowel surgeries took place that night, as the doctors put Liam's intestines back inside his body. "The next morning, I saw my son for the first time," Brianne says. "He looked so fragile, but we were relieved that our son was holding steady. We were finally together, as a family." That day the doctors put in a central line for Liam to receive nutrients intravenously, since his gut was not able to tolerate breast milk or formula yet. But Liam's troubles were far from over. "A little more than a month later, he was rushed to the operating room because his bowel was protruding through his stoma [a surgical hole for waste to exit the body] and the doctors couldn't push it back into position," Brianne says. "It was traumatic for him to lie there while the doctors attempted to manipulate the bowel. It was traumatic for me, too, but I tried to comfort him." After the doctors completed his second surgery, they told Brianne and Mark that Liam's case was more complex than they had initially thought. They discovered that his small intestine was wrapped around an artery, and there was also a malformation of his colon. "My heart sunk when the doctors explained the outlook without treatment, so once Liam weighed enough, he would have his bowel repaired again," Brianne says. During the third surgery, the doctors had to remove part of Liam's intestines, resulting in short bowel syndrome. This incurable condition means that Liam will be at risk for issues like poor absorption of nutrients, motility problems, dehydration and bacterial overgrowth throughout his life. Liam's fourth surgery helped lengthen his bowel a bit and inserted a feeding tube though his stomach. When Liam was five months old, he finally came home. Even after that, there were many more hospital stays and emergencies. "Eventually, we grew exhausted," Brianne says. "We asked for as much training as we could get from doctors and nurses. We asked for new plans that were tailored to our son's complex case." As time went on, though, things got a little bit easier. Liam still has his feeding tube and receives some nutrients intravenously, but his parents are working on getting him to eat more by mouth. Hopefully as he grows up, he will be able to eat normally, but will still be at risk for intestinal problems due to his Short Bowel Syndrome. "If you were to see Liam in his element, you would think nothing was different," Brianne says. "He's a happy, charming, smart and silly 2-year-old explorer who likes flirting with his nurses. He has come a long way." Unlike Brianne, Yvette Soto had a very short time to prepare for having a baby with gastroschisis, as her daughter Sophia was diagnosed at 31 weeks and was born at 35 weeks. "I was two weeks away from my baby shower [when I found out] and I didn't even know if I wanted to have one anymore," she tells Fit Pregnancy. "I was super confused and had never even dreamt that something like this could happen." For Yvette, Sophia's birth was the most traumatic part of the experience. During labor, Sophia's oxygen level dropped. "My daughter was born not breathing," Yvette says. "She didn't have a heartbeat and she was gone for a little over 25 minutes. I was in shock and all I wanted was to hear her cry. A doctor came over and told us that they could only keep trying for another five minutes but that we should prepare ourselves to lose our daughter. They were about to call time of death when they heard just a little tiny heartbeat and rushed her to the NICU." Because she had been deprived of oxygen, Sophia had to be monitored for seizures and possible brain damage, and couldn't have the surgery to put her intestines back until she was one week old. "It was a hard and stressful time," Yvette says. "All I wanted to do was take my baby home." Thankfully, Sophia had no long-term damage from the birth. After a couple of months, Sophia was able to come home. But she soon landed back in the hospital because she wasn't able to keep food down, so a line to feed her intravenously was placed. Several months later, her line fell out, and the doctors decided to see how she would do without it. "I prayed that she wouldn't lose weight and that she wouldn't have to be put on it again," Yvette says. "She didn't lose weight—she actually gained, and has been since!" Now 2 years old, Sophia is completely recovered from her gastroschisis. "If you didn't know her history you would never know that she had been through so much," says Yvette, who's now expecting another baby without gastroschisis. "I was very worried and scared that this baby would also have gastroschisis, but thank goodness she does not. I was very relieved and happy to know that she was going to be healthy." Brook Murray Chisholm found out about her baby's gastroschisis at a routine ultrasound when she was six months along. "I don't think there is a word for the way I felt, but shattered may come close," she tells Fit Pregnancy. After being monitored closely throughout her pregnancy, Brook delivered her son Finnegan vaginally at almost 38 weeks, and then he was whisked away for his surgery. "The first time I was able to see Finn was 10 hours after he was born, and he was under so many drugs and painkillers that he was entirely unresponsive," Brook says. "Slowly he was able to come off all forms of support and medication, until the only thing stopping us from taking him home was for his intestines to start working." After being in the NICU for 50 days, Finn was able to be fed pumped breast milk through a feeding tube. 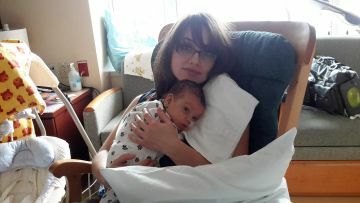 "The combination of knowing that he was always hungry and not being able to even hold him for weeks at a time after he was born caused extreme loneliness in me," Brook says. "Eventually he was able to breastfeed naturally—but that was not until the day he came home, 77 days after being born." Although he needed many procedures to have intravenous lines and other tubes put in, Finn did not need any additional surgeries and is now a happy and healthy 14-month-old. "We are blessed that [his] gastroschisis is not something that could potentially affect him for the rest of his life," Brook says. "He had absolutely no problems following his hospital visit. Not every baby is as lucky as Finn. The NICU is an extremely strong memory, but it is a memory of the past." Brook is currently pregnant with twins, and recently found out that one of them also has gastroschisis. Although the cause of the condition is not known, it's possible there are some genetic factors at play. "We are going into this pregnancy knowing how amazing our son turned out," Brook says of how she's dealing with the news. "We trust our surgeon entirely, and we know there is nothing we can do to change what has happened, so we are staying positive and just excited to know that we have two little girls that will be a beautiful addition to our family." Although these moms' experiences show how different gastroschisis can be from case to case, most kids with the condition do go on to lead normal lives. "I remember the doctor saying if you had to choose a birth defect, gastroschisis would be the one to pick," Brook says. "That just sounded so insensitive, but now that my son has been out of the NICU one year this month I understand what he was talking about." Some children do have life-long complications, like Liam's short bowel syndrome, but most are not life-threatening. Unfortunately, gastroschisis is on the rise, with 2,000 babies born with it each year—and the CDC doesn't know why, so it can be hard to know what to do to prevent it besides the general health recommendations for pregnant women, like not drinking alcohol or smoking. "Birth defects and NICU stays can happen to anyone," Brook says. If it does, there are many resources to connect parents dealing with gastroschisis, such as Avery's Angels, a non-profit that raises awareness of the birth defect, and various Facebook groups. "Through those groups, other moms and dads cheer each other on, and offer advice to help each other cope," Brianne says. "There were some moms I really bonded with and we continue to support each other. They have a special place in my heart." Ultimately, the experience of having a baby with gastroschisis gave the women we talked to a deeper appreciation of being a mother. "You will cry and be scared, but that's normal," Brianne advises other moms going through it. "Cherish the little moments and your child's own milestones, such as the first time you get to do kangaroo care, the first time your child eats, the first bath, or the first poop." Brook agrees: "It is extremely difficult to understand that when you are going through the middle of the hurricane, but once the storm passes you can see that you were only becoming so much stronger and deeper of a person. I would never trade a moment with my son."